If you use Workplace ServerWorkplace Server is a component of the Autotask Workplace service. It makes all your files accessible through Workplace while retaining local, centralized data storage so that your data is also available via your local area network (LAN). The Workplace service keeps all data on your LAN accessible internally and in sync with Workplace., this page allows you to manage the servers associated with your team. If any sync errors have been generated by a server associated with Workplace, the number of errors will appear in red next to the Manage Servers tab name. DeviceA device is computing device that has access to Autotask Workplace, including both mobile devices and computers. Summary information about the server, including the name of the device, status (Online, Offline, Disabled, or Recycled), the operating system, and if applicable, additional status-related information (e.g. if the status is Recycled, this column will display the number of days before it will be permanently removed. This column cannot be hidden. 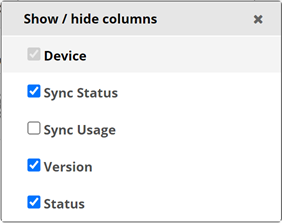 Sync Status Indicates whether or not the device is fully synced or if it has not been configured. Sync Usage The total size and number of projects being synced with this Workplace"Workplace" describes the Autotask Workplace service in its entirety. server. Version The version number of the Workplace Server agent installed on the device. Status Indicates whether the device is Connected, Offline, Disabled, or Recycled. If the device has been recycled, this column will display the number of days remaining until it is removed. Regardless of status, this column will always display the number of Workplace DesktopAlso known as the Workplace Desktop app, and in the context of this documentation, simply "the app," Workplace Desktop is the software installed on a computer that is responsible for synchronizing data between the local drive and the cloud. instances connected to the Workplace server. Online (24 hours) The number of hours in the last 24 hours during which the device was connected to the Workplace service. Online (7 days) The number of hours in the last 7 days during which the device was connected to the Workplace service. Connects (24 hours) The number of times the device connected to the Workplace service in the last 24 hours. Connects (7 days) The number of times the device connected to the Workplace service in the last 7 days. Uploaded (last hour) The amount of data that was uploaded in the last hour. Downloaded (last hour) The amount of data that was downloaded in the last hour. Uploaded (24 hours) The amount of data that was uploaded in the last 24 hours. Downloaded (24 hours) The amount of data that was downloaded in the last 24 hours. Workplace will remember the selections you've made, but you can change the configuration of the page any time you want. This provides you with a powerful administrative tool that allows you to track the precise status of all your team's servers. Drag and drop any column to a new location. Begin typing your query in the search field. The list will automatically update. To remove the query, click the in the search field. Use the check boxes on the left side of the list to select more than one server. Click the server. This will open the Server Detail page. Read the warning message in the resulting popup. For security reasons, enter your password.